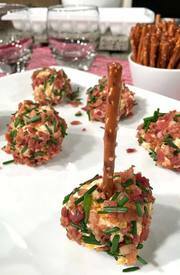 Bacon cheddar cheese ball bites make perfect holiday appetizers or game day snacks. Bite sized balls of creamy cheddar and cream cheese, rolled in crispy Bacon and chives. What’s not to love about this easy appetizer? !